The Wey River from Godalming to the Thames at Weybridge provided the potential for dramatically improving the transportation of goods to and from London. Three hundred and fifty years ago the river was virtually impassable and it wasn't until a local wealthy landowner, who was experimenting with innovative water management to improve his agricultural yields, struck upon the idea of constructing a canal that the idea was born. Eels thrive along the River Wey and used to be part of the staple diet for those that could either catch them or afford to buy them. Trappers would set eel pots, funnel shaped baskets, along the river and snare their catch. Eels hatch thousands of miles away off the West Indies and swim for up to three years before reaching the Wey. Here they can stay for up to 30 years before returning to the sea to spawn. That is of course if they don't get caught first . . . .
Travelling around parts of the Wey Valley you may encounter wooden signs and large roadside sculptures carved with the Surrey Hills insignia. These were devised to draw public attention to this conservation area designated as an Area of Outstanding National Beauty. The River Wey was perfectly located to provide a springboard for influencing the industrial history of Britain in the 17th and 18th centuries. The Wey Valley has a richness of agricultural land, that for many hundreds of years before the idea of the navigations were even dreamt up, promoted a concentration of farming that brought prosperity to the valley’s landowners. Its location close to both London and the important Channel ports ensured a close involvement in the trading of a range of commodities that those important commercial and military centres required, and the fact that the valley straddled main thoroughfares between these centres provided considerable opportunities that were exploited to the full. A third influence, especially in the early centuries, was the fact that much of the valley fell under the control of the Bishop of Winchester, the third most powerful ecclesiastical body in the country. The story of the navigations began when a rich and powerful landowner, Sir Richard Weston (1591 – 1652) upon the death of his father in 1613 took the family title, and the wealth that it carried. From the family estate at Sutton Place (GR: TQ013536) on the banks of the River Wey outside Guildford in Surrey, Sir Richard, a well travelled nobleman and committed agriculturalist, had encountered many examples of advanced land management abroad, and now had ambitious ideas to adapt and implement these on his own estates. Whilst travelling extensively in the Low Countries (now the Netherlands and Belgium) one idea he had seen was the premature and controlled flooding of pastures. This technique, which involved the dropping of boards over drainage channels, irrigated the pastures and prevented them from being dried out by the wind. The water also raised the ground temperature by two or three degrees and so successfully warded off the effects of frosts. The end results considerably boosted hay yields, and the technique could also promote an additional harvest. Weston’s scheme back at Sutton Place involved the cutting of a man-made channel through the natural meanders of the River Wey and at Stoke he installed his first experimental lock to control the waters. Weston coined the term ‘float pastures’ to describe his adaptation. Never one to rest on his laurels when it came to exploring new ideas, Weston had also latched on to the benefits of providing fully navigable channels as highways, having seen successful schemes in the Low Countries. He dreamt of a considerably shortened route and all-year-round navigation along the River Wey, which would benefit the many conveyors of goods along the valley, and for which he would collect considerable revenues from tolls. 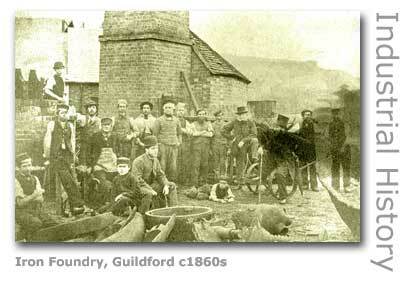 So began what was to become a life-long struggle to canalise the river from Guildford to the Thames. The scheme almost failed from the start when he encountered considerable opposition from the other landowners across whose land the canal would need to be constructed. It was not until he managed to get royal backing from King Charles I in 1635 that the canal saw its first spark of life. Weston then hit a major obstacle. Shortly afterwards Oliver Cromwell (1599 - 1658) and the Parliamentarians took control of the country and so triggered the English Civil War. Charles’ downfall put royal sympathisers at considerable risk. Even worse for Weston was the fact that he was a practising Roman Catholic and the coup had firmly placed the Protestant Puritans in power. In fear of their lives Weston fled with his family to Europe, and his lands at Clandon and Merrow (both near Guildford) were sold to Sir Richard Onslow to be incorporated into the Clandon Park Estate (GR: TQ043513). Onslow was an important Parliamentarian and close to Cromwell’s seat of power. Weston did however have a friend in the Parliamentarian camp, Major James Pitson who was the Commissioner for Surrey. Pitson had great respect for Weston and arguing his case not only managed to negotiate for Weston’s safe return to England and his pardon, but also the rightful return of his estates. Pitson was later to become a financial sponsor and hence benefactor of the navigation. So after a delay of some fifteen years Weston successfully had a Bill for the construction of the canal sponsored and presented to Parliament on December 26th 1650. Significantly this was Boxing Day, revered by the Roman Catholics but banned by the Puritans who had abolished the celebration of Christmas. After 6 months the scheme entered the statute books with the Act passed on June 26th 1651. Much of the lack of opposition has been put down to the fact that Weston had cleverly avoided having any direct association with the application, having persuaded the townsmen of Guildford (Approved Men and the Mayor) to sponsor the Bill. The townsmen sought to benefit by reviving their declining trade with the new waterway. Weston was joined by James Pitson, Richard Scotcher and Richard Darnelly and together they managed to raise the necessary money for the construction mainly through loans and shares. Weston subscribed half the money (£3,000 for 12 shares) and the others each subscribed £1,000 for 4 shares. And now the hard and expensive work began. 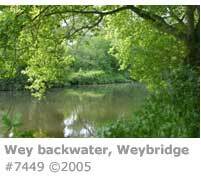 How to make the river between Guildford and Weybridge navigable? Extensive surveys identified a number of options, but the route you see today is pretty much the one identified by Weston as being the most practical over 350 years ago. With no machines in those days everything had to be done by hand with a full-time labour force of 200 men, known as navigators or navvies. Of the 15 ½ miles of navigable waterway to be made, over 9 miles had to be artificially cut across the meadows and fields, and 12 locks constructed. The timbers for these original locks and their gates came from the ruins of Oatland Palace at Weybridge. Sadly Weston died on May 7th 1652 with only a few miles remaining, leaving his son George to complete the task. The waterway was officially opened in 1653 having incurred a cost of £16,000, a considerable amount of money in those days, and one that had driven the Weston Estate into bankruptcy at one point. Overruns on budgets are not purely a modern phenomena as it was not long before more financing was required, and this lead to documented bitterness and distrust between the shareholders, and especially against Pitson who was accused of lining his own pockets. George Weston for all of his efforts even suffered the indignity of being imprisoned for debt at one point. These financial disputes required a further private Act of Parliament (Act for Preserving and Settling the River Wey) to be passed in 1671 before the mire of disputes concerning ownership of the canal, non-payment of compensation for lands lost or damaged during its construction, and outstanding loans and unpaid wages could finally be resolved. The Act included a provision for tolls to be paid to two landowners through whose estates the navigation had been built, and a penny per load charge was levied for the Guildford authorities who used this money for the relief of the poor. These additional tolls made the Wey Navigation expensive to use resulting in further disputes that ran well into 1700. The financial difficulties that beset the project throughout probably led to a few economies being made during the works, as 25 years after it opened extensive repairs were necessary. The construction itself however was a considerable achievement and one that was to lead the way for Britain. The Wey Navigation, although not the first man-made navigation to be constructed was certainly then the largest and the first commercially viable waterway in the land, effectively preceding the so-called Canal Age by at least 100 years. The navigation provided a wealth of proven practices for the canal builders that followed later, and.was to become the model that encouraged a flurry of waterway building activity across England. Daniel Defoe (1660 - 1731), the soldier loyal to William III and author of many works including ‘Robinson Crusoe’ was a resident of the Wey Valley. 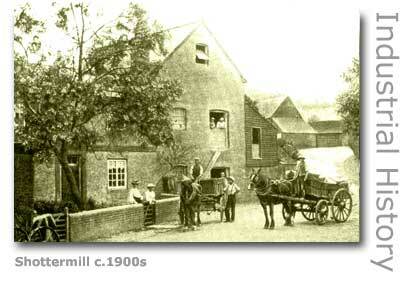 He remarked in 1724 that the Navigation had become a “mighty support to the corn market in Farnham”. During that decade the annual tolls generated by the waterway averaged around £2,000 from a tonnage of 17,000. By 1800 this had increased to 57,500 tons providing an income of £5,860. Shareholders in the Wey Navigation included the first Earl of Portmore, David Colyear (1656 – 1730) and George Langton from Lincolnshire who owned half-shares of the waterway at £3,000 each in the 1720s, a considerable investment at the time. Both the Portmore and Langton families were shareholders for a century or so. Others included Dame Ann Perkins, Joseph Lee and the heirs of James Pitson, although by the early 1720s all their shares had been sold to Colyear and Langton. The shareholders never actually owned the Navigation as its inventory of locks, weirs, wharves and buildings as well as the canal itself were held by Trustees appointed by an Act of Parliament passed in 1671. The shareholders sought to gain from the profits made after the tolls charged on traffic and others benefitting from use of the water had been accounted for to maintain the canal. The wealthy Lincolnshire businessman and landowner, George Langton (1647 - 1727), had obviously decided that the Wey Navigation was worthy of investment, for during his lifetime he continually sought to acquire greater control of the venture by increasing his shareholding. His first shareholdings date back to 1684 upon his marriage to Mary Tindall. Thomas Tindall had held the shares and these were bequeathed to his daughter upon his death in 1682. Langton earned £2,000 on average per year from his share of the Navigation's profits, a considerable sum at the time. These profits were generated by tolls and fees imposed on the mills extracting water for power, the wharves providing cargo handling and storage and the considerable barge traffic using the waterway. As shareholder his involvement in the numerous disputes with bargemasters, mill owners and navvies maintaining the canal was quite demanding. Langton recorded much of his commercially related activity in a series of diaries, and his collection of letters and almanacs all provide a fascinating insight into the day-to-day operation of the Wey Navigation. He records that the Navigation had to pay the mills operating along a section of the canal a fee for penning the water to ensure that it was deep enough for the barges to pass. The payments were in compensation for the fact that the mills were unable to power their machinery whilst the canal was topped up. So for example Woking and Newark Mills each charged 2s. 6d. and Stoke Mill 5s. 6d. for each barge passing downstream. The following is a transcript of a letter sent by the wharfinger at Dapdune Wharf to Langton at his London home in Soho Square in 1716. "Sr. There is a years land tax due to our parish & likewise to Stoke, & to the poor which will come to near twenty pound one way or other, and I have drason upon the the bargemasters but they cannott pay it, the Collectors threaten to return me into the Exchequer Except it be paid this week. I think it would be much better to order one or other of the bargemasters to pay once a year as much money as you think the taxes & other dutys come to and then I could pay as they come for it and save a great deal of trouble, I have not received my half years sallerey due at Lady day last, for they say they cannot pay me and am Sr your Duty full ser't. H Dean." Another letter written to Langton in 1692 details ongoing disputes with the Navigation's bargemen. "Sr. I have taken what care I can to return you some money suddenly, I have wrote to Mr. Wetton to pay you 20L, and one of ye Bargemasters hath promised to pay you 40L or 50L next weeke; I ordered a man to pay Mr. Clutterbuck 30L ye last weeke, but not finding either Mr. Clutterbuck or Mr. Leach at home he brought his money out of London wth him; th 40L wch was in dispute appears not to be received by Mr. Gawdy and I have satisfied Martin that it was double charged! I would have waited on you at London but Mr. Onslow hath laid his commands me to goe wth him a journey wch will take up about 14 or 16 days time! I have had a little trouble wth some of the Bargemen, I have refused them signing the Articles because they are so much in Arrears, they promise to be made at my return, I am Sr your most humble servant. Henry Pawley." The following are extracts from George Langton's will of 1717 bequeathing his share of the Wey Navigation. "I give to her (his wife Mary) our Moiety (1) or half part of the annual profits that shall arise after my death from my Share or Interest in the River Wey in the County of Surrey, during her life and the other Moiety of the said Profitts I give to my three Sons William, Peregrine and Samuel for their lives, but if the Legacyes hereafter given to them shall amount to £80 per annum to each of them then my Will is that my . . . . Wife should have the other Moiety, likewise for her life." "I give to my three younger Sons, William Peregrine and Samuel all my Share and Interest in the River Wey aforesaid after their Mothers death to be equally divided amongst them every year for the Term of their Lives, the payment to my Lady Parkins (2) and other Charges being first deducted." Langton is documented as having tragically lost his infant son to a cold at only the age of two and a half months, disastrously lost his personal brewer who died after falling out of a tree trying to dislodge a swarm of bees, and suffered from deafness, noises in the head and gout, receiving treatment for the latter by being 'cupped' for half a pint of blood at a time. He is also recorded as having noted from a contemporary reference book how to make invisible ink from urine, a sign perhaps of 18th century business secrets paranoia. It was not for almost another one hundred years that the upstream extension providing navigation from Guildford to Godalming was constructed as the Godalming Navigation in 1764. This resulted from a separate Act of Parliament passed in 1760 and benefited the Wey Navigation considerably by generating additional income from the increased traffic. The opening of the new navigation also brought an additional benefit to the town of Guildford. Prior to the construction of the waterway highly volatile cargoes of gunpowder were carried by horse and cart from the powdermills at Chilworth to Guildford, passing through the settlement along bumpy and dangerous roads. The new gunpowder wharves constructed at Stonebridge near Shalford meant that this practice could cease and a safer transportation by water could be employed. Both Navigations required considerable maintenance, not just to the waterway itself but also the locks, weirs, bridges and various buildings, and this was one of the reasons why both Navigations were eventually gifted to the nation under the day-to-day care and control of the National Trust. Local historians have identified documentation relating to the Wey Navigation which showed that in 1725 there were seven regular professional employees including an accountant, master carpenter, five wharfingers running wharves in Guildford, Send, Walsham and New Haw. Labourers or navvies who had the task of rolling up their sleeves and undertaking the heavy work of clearing the waterway, shoring up banks and clearing overhanging trees and undergrowth from the towpaths were covered in the accounts by the master carpenter’s expenses and their exact numbers have been difficult for the historians to determine, although they were likely to be short-term jobbers taken on as and when they were needed. In the 1725 accounts there was no mention of lock-keepers so it is likely that the wharfingers listed as well as supervising the loading, unloading and storage sheds at the wharves also had a responsibility for the locks as well, duties which would have included controlling water levels and inspecting banks. In later years a new breed of dedicated lock-keepers were introduced. The careful observer along the waterway manned with a map will be able to determine between the separate natural courses of the river, the combined waterway where the river has been straightened and dredged, and the man-made cuts. In addition your map will be criss-crossed by a plethora of narrow blue lines. 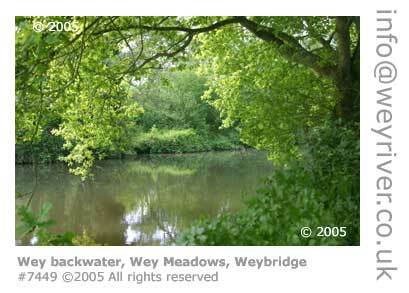 Some of these will be the tributary rivers and stream for the Wey but others are man-made trunks. Many of these were dug by the Navigation to aid in drainage and flood control, and some were illegally dug by landowners to take water from the river. Many of the trunks are buried in pipes, often hollowed from trees, and many of the legal ones allowed the Navigation to drain a stretch of the waterway for maintenance. The Wey Navigation had always been managed by a Trust, the Commissioners of which ensured that the tolls received were properly used to maintain the waterway before the shareholders received the profits. This safeguard had been laid down by the Act of parliament. In modern times the Stevens family, bargebuilders based at Guildford, had bought the Wey Navigation but eventually through Harry Stevens upon his retirement at the age of 77 bequeathed the waterway to the National Trust in 1964. The Godalming Navigation, which had been opened 100 years after the Wey Navigation, always had different shareholders these being mostly local landowners with an interest in transportation, and was also run by Trust Commissioners under an Act of Parliament. In 1967 the Borough of Guildford obtained the Godalming Navigation through an Act of empowerment which enabled it to hand control of the four mile canal over to the National Trust in 1968. The Trust maintains the two navigations using traditional techniques and materials wherever possible in order to preserve the spirit and visual amenity of the waterways. The income from licences of the navigations' users provides a significant contribution to the running of the navigations. To comply with the Acts of Parliament of 1670 and 1760 which established the responsibilities of the Commissioners for the Wey and Godalming Navigations, in particular to maintain the waterway in a navigable condition. In accordance with the general principles of the National Trust, to preserve the Wey and Godalming Navigations for the benefit of the nation, including the preservation of their natural aspect, features, animals and plant life, buildings and structures of architectural or historic interest, and the promotion of access. To enable quiet and varied enjoyment of the waterway by the public. The Trust provides a number of services in order to meet their responsibilities as the navigation authority. These include dredging, bank and towpath repairs and the maintenance of locks. The Wey Navigations are prone to silting with the biggest problems usually occuring on bends and at junctions between the canals and the natural courses of the river. In the early days all clearance was undertaken by hand but today the Trust operates its own waterbourne dredger which usually operates in early spring to clear silt movement over wet winters. The river banks and towpaths require constant maintenance. The Trust maintains aquatic plant growth along the edge of the channel to help protect the banks from damage by the wash of passing boats and also to provide a habitat for wildlife. A rolling programme of lock restoration and refurbishment using traditional materials and techniques which includes using hand-made bricks, lime mortar and oak lock gates. Major repairs to a lock chamber require the lock area to be dammed off and pumped out. All craft regardless of size require a licence from the National Trust in order to use the navigations. Windlasses (lock handles) suitable for use on the Wey Navigations can be loaned or bought from Thames Lock, Stoke Lock or the Trust's Navigations Office at Dapdune Wharf in Guildford. 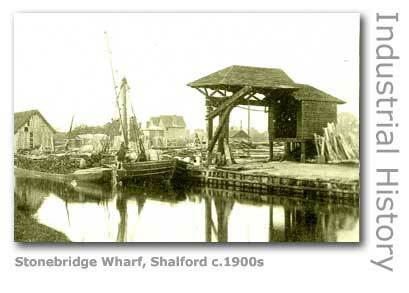 The Farncombe and Guildford Boathouses, and Pyrford Basin can also supply windlasses. 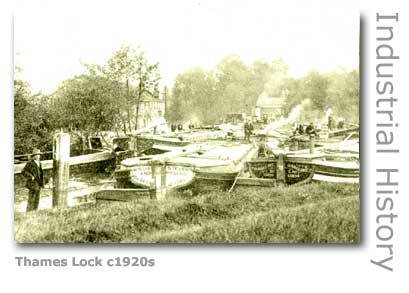 Slipways operate on a chargeable basis at Stoke Lock and Pyrford Basin. The only free slipway is on the River Thames at Thames Street, Weybridge which is not operated by the Trust.